More spectacular in reality than imaginable, Gulmarg, once the go-to destination for filmmakers of yesteryear, will leave any visitor awestruck. From 18-hole golf courses, trout fishing, skiing and cable cars to trekking, helicopter rides or horseback riding, you need not go as far as Switzerland to have a proper winter wonderland holiday experience. Gulmarg greets a lot of visitors year around but if snowy adventure sports, offered here during the winter months, is not your cup of tea then head here in the summer and enjoy a host of cultural, religious and outdoors experiences. With scores of hotels, restaurants and tour operators, offering packages to meet any budget, Gulmarg is waiting to give you the experience of a lifetime. Here are the top things to do in Gulmarg. Best time to visit: Bustling year-round with visitors, Gulmarg is always exciting. However, winters can be harsh and unpredictable so unless skiing is your reason to visit, the summer is a more practical choice for families and those that want to enjoy the outdoors. Travel recommendation: From a few days to a couple of weeks, there is plenty to do in and around Gulmarg. Nearest railway station: Jammu Station, the closest to Gulmarg, is about 300 kilometres away and not practical unless planning to make visits to sights en route to Gulmarg. Nearest airport: Srinagar Domestic Airport is well connected to airports around India and is about 50 kilometres from Gulmarg. Transportation: Public and private transport is easily available; bus, car, horse, helicopter and cable car are all easily accessible. The most famous destination in Kashmir, Gulmarg Gondola is also the highest and longest cable car in Asia. Host to many national and international skiing events, you can hone your skills at the slopes whether you are a beginner or an expert. The first stage of the exhilarating cable car ride will take you to Kongdori, at an altitude of above 10,000 feet. No matter your budget, there, you can find great accommodation and get cozy indoors or hop on a snowmobile and enjoy the breathtaking view of the valley. Timings: 10 am to 4.30 pm. Closed on Sundays. When to visit: Year-round activities, but best during the winter (equipment is available on hire). 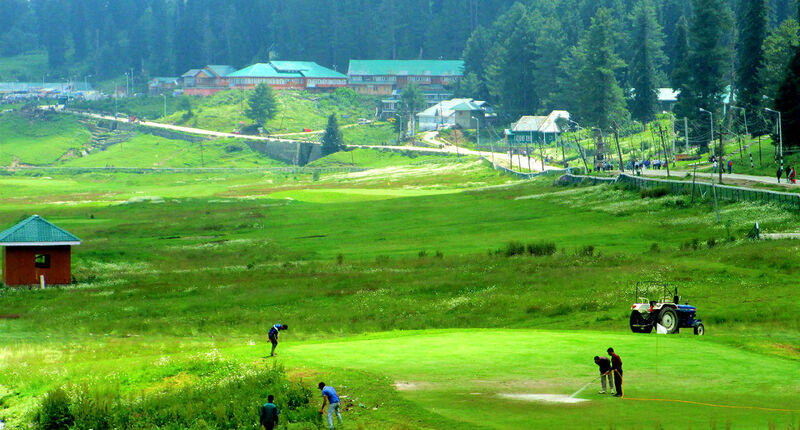 One of the largest golf courses in the country, Gulmarg Golf Course has quickly emerged as a leading Indian golfing destination. Escape the summer heat and head over to enjoy the magnificent 18-hole, 72-par course like no other in the world. Learn how to play golf at the courses club or get some specialized instruction to improve your game. Facilities are top-notch and the club plays host to many tournaments and events. When to visit: Best during the summer if you want to especially enjoy the course. Avoid it completely during the winter. For over 15 years the Gulmarg Winter Festival has drawn artistes and travellers from around the world. The festival, usually held during the last weeks of January, is an extravaganza of music, movies, dance, photography and of course, adventure activities. Pick up handicrafts or souvenirs from the pop-up flea market or indulge in the some delicious local cuisine. The weather gets chilly but the sentiment is warm. When to visit: End of January. Be sure to carry warm clothing and footwear. A mere 13 kilometres from Gulmarg lies this magnificent natural attraction, at the foot of the Apharwat twin peaks. The lake is amidst flowing meadows and is frozen and surrounded by snow and evergreens during winter. At an altitude of over 4500 feet, the lake is the perfect setting for the perfect picnic. You can also enjoy horse riding, ridge climbing, trekking and many other outdoor activities in the summer months. As the name suggests, this place is dedicated to children but everyone that visits Gulmarg Children’s Park leaves with a childlike satisfaction. From horse riding to zorbing, even hot air ballooning and a game centre, there is a whole day’s worth of things to see and do at the highest children’s park in the world. Have a picnic and take some memorable photographs with your family with one of the most beautiful backdrops imaginable. When to visit: All day, but there are fewer outdoors activities during winter months. 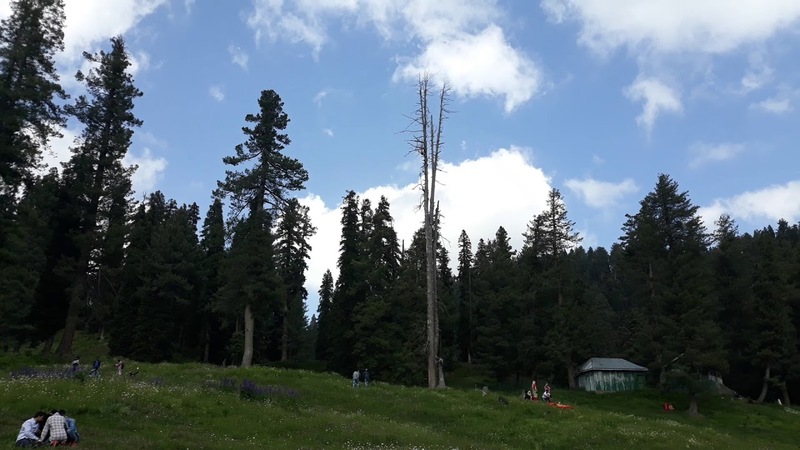 Encompassing nearly 200 square kilometres and bursting with life through the year, the Gulmarg Biosphere Reserve is famous for its biodiversity. Home to many species of plants, birds and animals; some of which are endangered, this sanctuary is a haven for bird watchers during the summer months and visitors flock to catch a glimpse of the rare musk deer and red foxes and bears during the winter months. When to visit: Through the year between 10 am and 4 pm. Tours and guides will take you around and organize relevant equipment. During the summer, the valley comes to life! Pick fresh sweet strawberries right off the trees in this famous backdrop of movies from yesteryear. Pack a picnic and enjoy the visual bounty of Mother Nature at the Strawberry Valley from April to September. Winter also sees some action with guided treks and horseback rides through the snowy paths. When to visit: In the summertime. Nestled between the picturesque Chinamarg and Nurpur pass, this mesmerizing mountain stream flows through the valley. Famous for its trout fishing, Ferozepur Nallah is merely 5 kilometres from Gulmarg center so trekking there is a great option. You can opt to carry your own gear or rent out supplies to go fishing. The sparkling waters of the stream and the fresh trout make for a perfect outdoor experience. Local restaurants and hotels provide budget friendly as well as more luxurious accommodation in the surrounding area. Be transported back in time with this 100-plus-year-old heritage structure. A one-of-a-kind Victorian styled monument, the St. Mary’s Church gives you a sense of history and tranquility. A visit during the summer is a must if you are in Gulmarg; however, the Christmas season is also celebrated with great fervor and a mix of local and traditional Christmas customs. Around you can find a few hotels to stay if you truly want to experience the strong British influences. 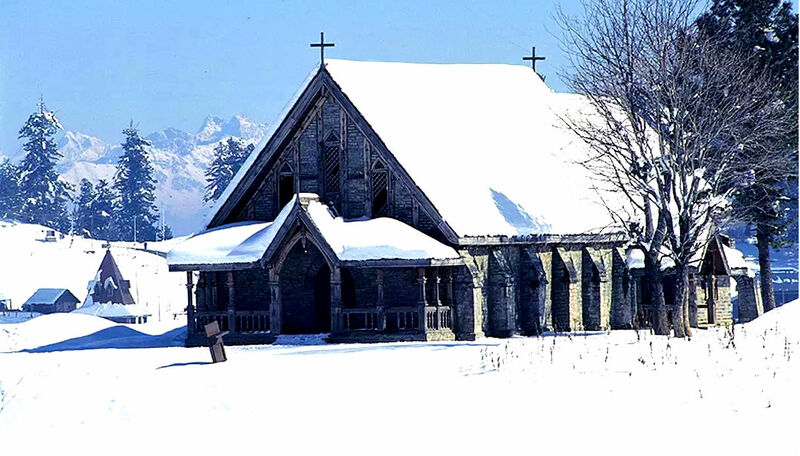 Visible from anywhere in Gulmarg, the shrine dedicated to Lord Shiva, was built about a 100 years ago for the wife of the erstwhile Dogra kings of Jammu and Kashmir. The royal Temple, situated on a hill top, is surrounded by numerous budget hotels that offer some great service, warm hospitability and local food. The climb up can get tricky in the winters so ideally target visiting during the summer months when the temple is fully visible as is the spectacular valley. Constructed in the 15th century, and one of Gulmarg’s most visited religious sites, the shrine of Baba Reshi is a wonder of old Kashmiri architecture. The lattice work windows and wooden pillars showoff the once famous Kashmiri craftsmanship. Baba Reshi, a Muslim scholar and saint spent his days praying and meditating in the luscious valley. Visit the shrine, lose yourself in the tranquility of the valley and find your spiritual self. When to visit: During the day; go early to avoid the crowds. Less than 3 hours away from Gulmarg lies Dal lake. Situated an hour away from Srinagar International Airport, Dal Lake is the perfect stop for those going to Gulmarg via Srinagar by air. Worth including into your itinerary, this favorite with honeymoon travellers has a lot more including its beautiful waterfront and postcard perfect meadows. Take a ride on a traditional Shikara boat or spend the night on the lake in a houseboat. Dal Lake makes for a relaxing romantic vacation. Approximately 80 kilometres from Gulmarg lies the ancient ruins of Awantipura. This 1000-year-old, once thriving village is home to the remnants of the Awantishwar and Avantiswamin temples. Apart from many artifacts, this ancient and historic site is flanked by lush greenery on one side and the Jhelum river on the other. Also surrounding the temple area are many smaller shrines with carvings and statues of various Gods and mythical creatures too. The monolithic pillars and sculptures are evidence of the once envious and flourishing Utpala kingdom. This picturesque hill station, close to Gulmarg, has always been enticing for spiritual travellers to the valley. Close to the banks of the Lidder river, and with a view of the Kolohoi glacier, hanging precariously in the background, Phalagam is dedicated to a form of religious tourism with visitors flocking from all over India and the world. The Amarnath cave, at an altitude of about 4000 meters, may seem out of reach but that does not deter devotees. Thousands flock to the Amarnath Yatra held each year around July and setup camp in the valley, making the long but scenic journey to the cave by foot. When to visit: Access is good in the summer; helicopters are available for hire and are fun and convenient. With a picture perfect view anywhere you look, cheerful and welcoming locals, fantastic foods and overflowing with culture, heritage and fun activities for all age groups, there is no need for an international destination when all your white holiday dreams can be fulfilled right here at Gulmarg.